Thanks to the new deal inked between Marvel Studios and Sony Pictures, we'll soon be able to see Spider-Man and The Avengers battle alongside each other on the big screen. And quite likely against each other, if the wall-crawler's first appearance comes in Captain America: Civil War next year, as expected. 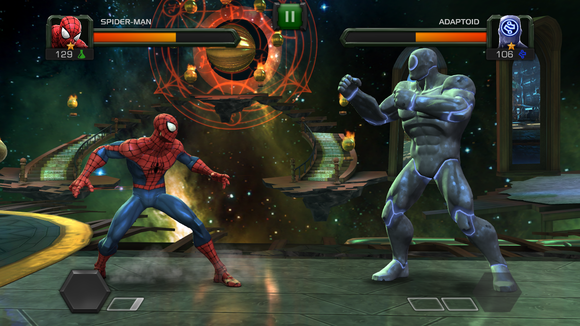 But you don't have to wait until then for slickly-produced superhero showdowns: you can enjoy them right now on your iPhone or iPad with Marvel Contest of Champions, an impressively-produced free-to-play fighting game that pulls top heroes and villains in from all corners of the comic universe. It has some of the familiar freemium trappings, as expected, but Kabam's tap-and-swipe brawler thankfully isn't beaten to a pulp by its business model. Contest's roster currently includes 28 playable characters, plus there are a handful of other fighters you'll encounter along the way. Contest of Champions appears, at least on its surface, to be direct response to the hugely popular Injustice: Gods Among Us. 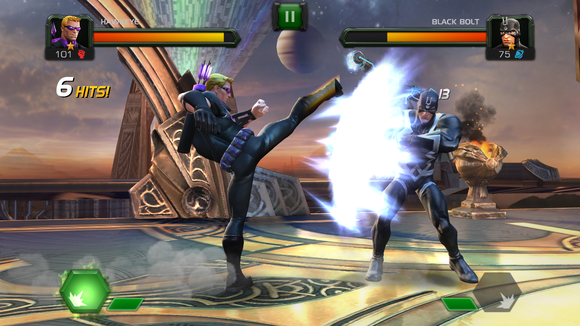 That DC Comics fighter, developed by Mortal Kombat maker NetherRealm Studios, has been a freemium smash in its mobile incarnation, implementing a card-battling aspect between the battles, plus featuring teams of three characters that you can swap between. The characters and backdrops alike are alluringly rendered in a style that splits the difference between comic and cartoon versions. But Marvel's offering is actually a lot simpler. Yes, there's still a progression system, and indeed, it can all feel like a bit of a grind. But without the card-collecting elements, Contest of Champions seems a bit less convoluted and a lot more approachable. It's a streamlined fighter built for touch, which means using frantic taps and swipes rather than memorized button combos, but there's a little bit of strategy to the action. And it didn't turn gnawingly repetitive in the hours I played. The action is simplified, but you can still block and dash away from moves, as well as use specials and charged strong attacks. 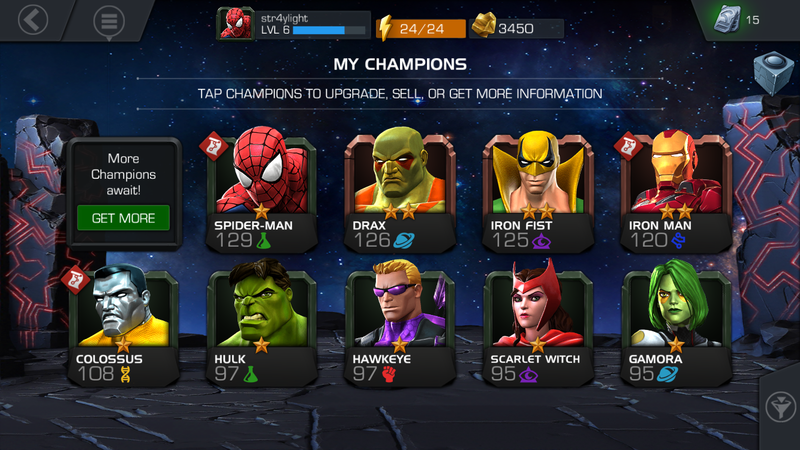 What really startles me about Kabam's offering is that it's such a great-looking game—one of the best I've played on the App Store. The cartoonish aesthetic is really well executed, with vibrant and detailed backdrops, fluid animations, and a fair bit of personality injected into characters and environments alike. Injustice has its own harder-edged visual take on its source material, but sticking closer to the Marvel comic look works wonders for Contest of Champions. You're always given a matchup appraisal before Quest fights, and you can change characters if desired. Some may have an elemental advantage over others. Much of your time will likely be spent within the Quest, which delivers dozens of maps screens to fight through, each with a few fights contextualized by short dialogue exchanges. The story isn't terribly exciting, but the progression lets you battle a wide array of foes, including characters from the Avengers, X-Men, and Guardians of the Galaxy books. "Online matches" are also available, but it seems you're only fighting the A.I. controlled version of another player's upgraded character. True online play against live opponents would be a huge, huge perk here if added down the line. 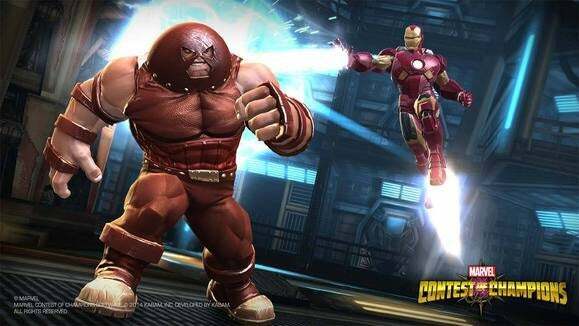 No surprise: Contest of Champions is a free-to-play game, and as such, it has some of the typical impediments that can drive players up the wall. There's an energy system, with your meter drained by movement on the Quest map. And if you play online matches, the character you use is then inaccessible for two hours. Additionally, player health must be refilled using power-ups, while fallen heroes need to be revived with items. Crystals are key to unlocking new characters and power-ups. The freebies sometimes get you low-level fighters, but you might be tempted to spend real money to get better combatants. 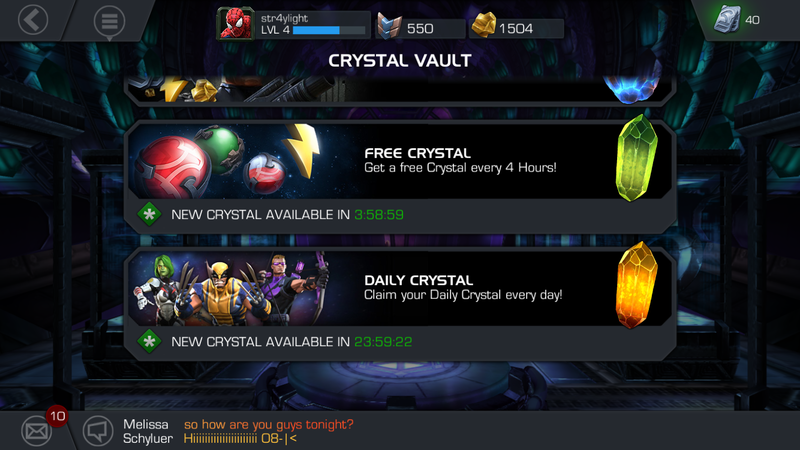 Redeeming crystals lets you get new heroes and free items, and some crystals are awarded through battle or by claiming free daily giveaways. However, it's always the low-level fighters awarded for free, and at least in the hours I played, the only way I was going to get a three-star or four-star character was by buying crystals with slow-to-accrue units (the premium currency). Naturally, you can buy units in bundles ranging from $5 to $100. But it works: on my third spin, I ended up with a four-star version of Star-Lord—a real find. Granted, I spent $15 on in-app purchases to get to that point. But I never felt compelled to spend money elsewhere in the game. The energy system might constrict if you're looking to play for long stretches, but a few fights at a time was never a problem for me. 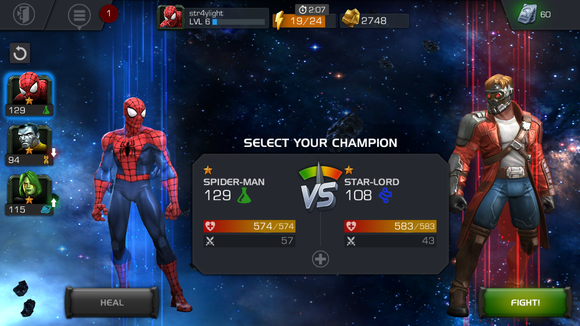 Contest of Champions is also pretty giving with its power-ups, but the combat isn't terribly taxing in the early battles. I imagine long-term play could be a very different situation once you're deeper into the Quest, but the early hours don't have any huge red flags. 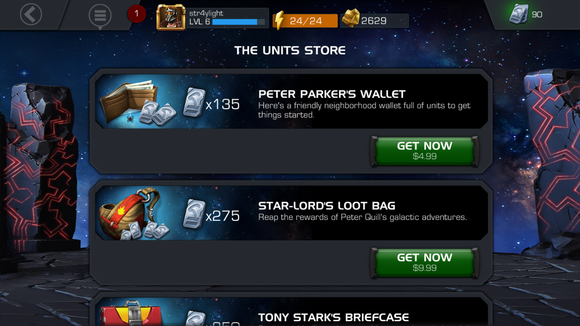 Units are the premium currency in Contest of Champions, and they're awarded sparingly through the Quest. Otherwise, you can buy them in packs up to $100 in value. Most importantly, the lack of combat boosts is key—I couldn't find a way to spend a couple bucks for a short-term advantage in a fight. Sure, you can build up your character with ample upgrades, but the game typically matches similarly skilled players for the multiplayer showdowns. Money always plays a role in these games, even if it's just buying access to more advanced fighters; I'd never compare it to a well-balanced, fully premium fighting game, after all. But as a freemium game, Marvel never seems out of line. After my experience in my last Freemium Field Test with the brutal, banal grind that is Game of War: Fire Age, I'm sort of dumbfounded to discover that Marvel: Contest of Champions opted to be a game first and business model second. Yes, the familiar freemium restrictions are there to tempt the heaviest players into spending—and indeed, there's incentive to spend that money. But there's no sense of being required to pay to have fun, which is a very key distinction. Contest of Champions is a perfectly solid, streamlined fighting game with excellent presentation and lots of popular characters. It's not incredibly deep, and the fighting probably isn't going to feel as exciting after 500 battles as it does after a few dozen, but there's still several hours of free fun to be had here.